This larger 18x24 is a very noticeable security sign for homes and businesses. It can be mounted on U-Channel Sign Posts or front/back doors, walls near store and business entrances. 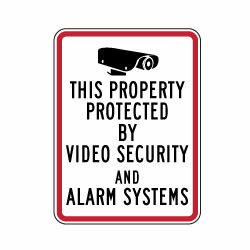 This Home, Property and Business Video Security Cameras sign is also available in a smaller 8x8 size, recommended for small windows or areas.